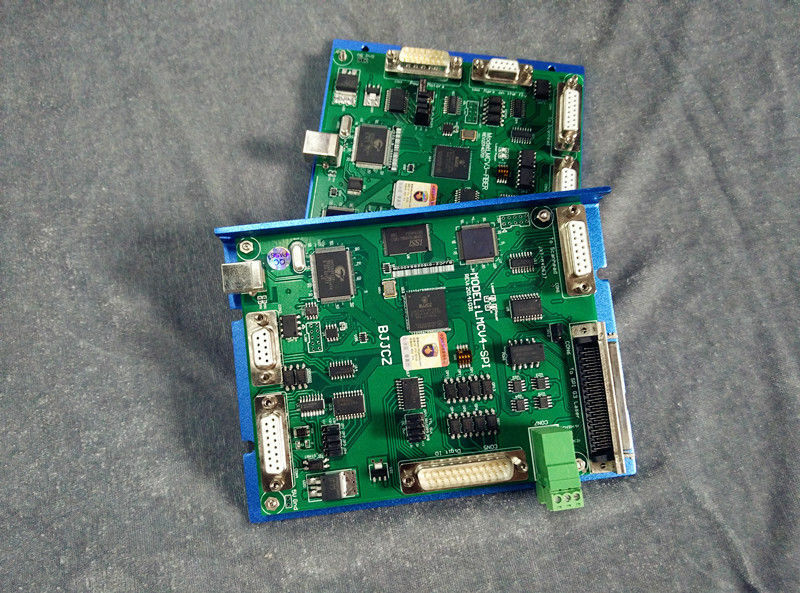 SPI laser marking card can be used to control the SPI G4.0 laser machine to marking,engraving,cutting on surface of material.Software EZCAD Support SPI laser type. 68-pins SCSI 3socket is used on the board to connect SPI G3 laser module directly . 8 routes general output signal . (TTL compatible).out 4/5/6/7 can be changed to open-drain mode by jumper to drive small power relay directly . 13 routes of input(TTL compliant) .In0, In4-In13, XORG0(IN14), YORG0(IN15) . Mark-on-fly: encoder can be connected to the board to measure the fly speed . Remark function: this function is used to remark what ever is in the memory of the board,especially convenient for high speed marking of a same pattern. Mark-on-fly:encoder can be connected to the board to measure the fly speed . Extend axis output:Two Direction/pulse signals,used to control stepping motor or servomotor for rotary marking and split marking. 8 routes of output(TTL compliant) .Out0-7 output from CON5 ,and out4-7 could be OC. Protect the board from humidity, dust, corrosive vapors and mechanical stress. Carefully check your application program before running it. Programming errors can cause a break down of the system. In this case neither the laser nor the scan head can be controlled. For storage and operation, avoid electromagnetic fields and static electricity. These can damage the electronics on the product. For storage, always use the anti-static bag. The allowed operating temperature range is 25℃ ± 10℃. The storage temperature should be between –20℃ and +60℃. Work stable,operation simple,easy to learn,famous software EZCAD,low cost,USB connection.